the demon Mahishasura and his retinue, than Dasara! According to the legend, the war lasted for nine days and victory prevailed on the tenth day - the Vijaya Dasami day. It is considered auspicious to start any venture on this day for its glorious success. Mother Goddess is worshipped on all the ten days with great fervor. It is also a dolls festival and children and women get busy with Kolu or Bombe Koorisodu. The various types of dolls made of mud are show cased on nine steps constructed for the purpose. This is to illuminate the fact that the diverse creations are all made up of the one and the same element. Animals, fish and birds are usually arranged on the first step from the ground, and then human beings and the avataras follow, culminating in the Divine form of the Goddess on the ninth or the highest step, indicating the evolution of creation. 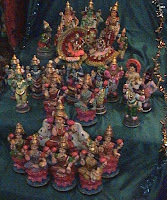 The picture alongside shows a Nala Gowri puppet. These puppets are life size, an can be assembled in a variety of postures, and dressed up in different costumes. Married women (Suvasinis) and young girls (Baalaas) are considered as the Goddess personified. They are invited and honoured with taamboolaas (Betel leaves, areca nuts, kumkum and turmeric powder, coconuts and flowers) as a mark of reverence. They are even treated to a grand feast at least on one day, if not on all the ten days. Every day a special dish is offered to the deity during the pooja. Sakkarai Pongal, Ven Pongal, Curd rice, Tamarind Rice, and different types of payasams are prepared for the purpose. 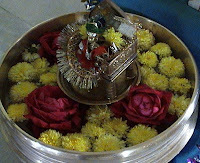 Sundal is prepared and offered in the evenings and it is distributed to the visitors who come to view the kolu. Here is the recipe for Paal Payasam which I learnt from my athai (aunt) - who used to celebrate Navaratri with great religious fervour. Paal Payasam is a rice and milk based porridge like sweet, cooked a in heavy bottomed bronze vessel called Urli (see picture below). Rice is cooked in milk on slow fire for a long time until it reaches the creamy and right consistency. We can achieve more or less the same result by using a pressure cooker which is less time consuming and demanding less attention. 1. Soak saffron in a tablespoon of warm milk and keep it aside. 2. Soak almonds in warm water, peel and coarsely crush and keep aside. 3. Dry roast rice until it acquires a reddish colour. 4. Wash the roasted rice and add the milk and pressure cook until three whistles. 5. Leave it on low flame for five more minutes and turn off the flame. 6. When the pressure subsides, open the cooker and add sugar. 7. Cook without the lid until the sugar blends with the payasam. 8. Add saffron, powdered cardamom and crushed almonds. Enjoy the creamy and rich Paal Payasam after offering it to the deity. This post goes to Navaratri & Navaratri Festive Food Event hosted by our dear blog friend Lakshmi of Taste of Mysore. That is so beautiful Dibs. Happy Navarathri. perfect! I am so reminded of my childhood days now....thanks for posting the kalya set ..i was searching for that all along!i simply luv it! Such a informative post about Dasara. Paal Payasam looks yumm. Could you please send this to Navaratri Festive Food Event which I am hosting at Taste of Mysore..Happy Dasara to you and your family. wonderful info..lovely pics. Paal payasam is my fav, and it looks great. Lovely pics and informative post about dasara.....Paal payasam is my fav, and it looks divine. Happy Dasara to you and your family. It was a pleasure for me to come across your site! I am a Bengali married to a Telugu foodie, so I was frantically looking for a website which posted authentic south indian recipes! Now, it looks like my search is over! Enjoyed the Kolu and the paal payasam from my seat ! Lovely ! Hello Friends, Thanks for your comments. Happy Dasara and wish you have a a 'delicious' festival! Excellent!! I am also a foodie, but had little idea of so rich south indian food items. Fabulous item. Would like to taste! Great to see that you manage to take snaps during cooking too! Deepawali Sweets - Bournvita Fudge! Vijayadashami in Seeplaputhur, and Kuzal Puttu!